Artists’ rights, and don’t pay to play! And an important piece of legislation for artists is making its way through Congress. Now’s the time for you to weigh in on increasing copyright protections for artists and creatives. The Case Act, HR3945, will establish a small-claims type process for infringement, meaning artists don’t have to pay huge fees to copyright attorneys to recover theft and misappropriation of their art. Read more here and contact your Representatives. 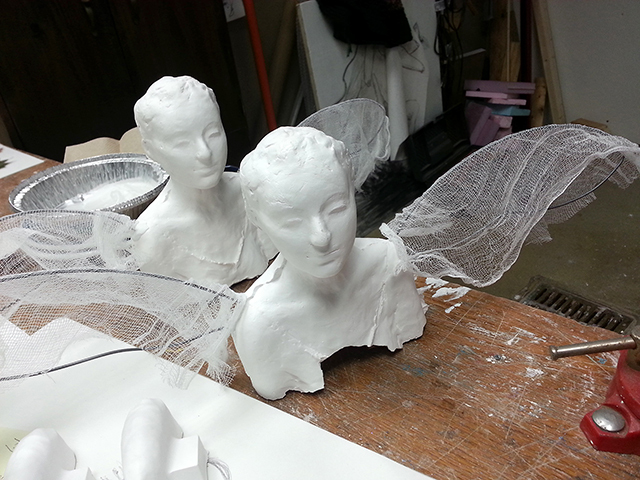 Having a great time with the wing fittings today–the angels are coming along nicely. I’m happy to report that my Kickstarter project was fully funded as of this morning! 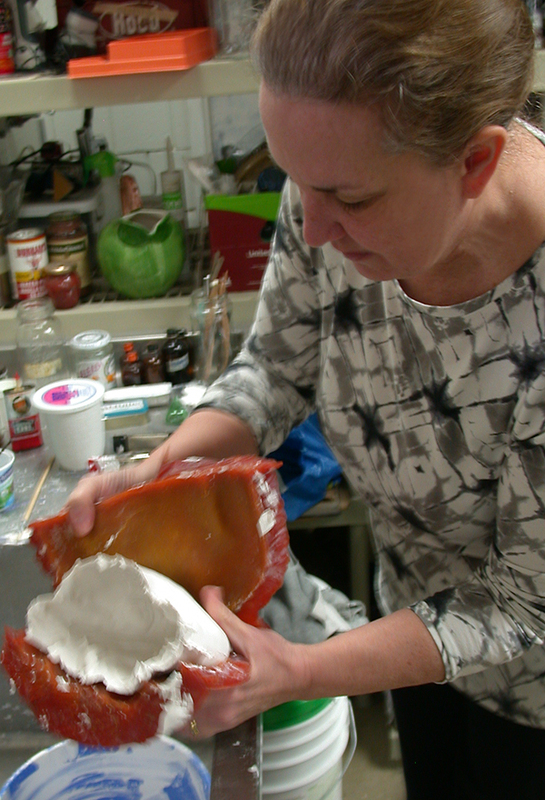 There’s still a few days to go before the time line ends, but I’m starting to cast the reward sculptures. These angels (of our better nature?) were first seen floating above the installation “Who Lives With Us.” Stop by ArtSpace at 4pm this afternoon to see how they’re made! On an overcast August 9th in southern New Hampshire, Kiki Smith was awarded the 50th Edward MacDowell Medal. In her brief acceptance speech, Smith talked about a recent printmaking stint in New Mexico, and urged the MacDowell committee to make future awards to non-white artists. Called a “leading figure among artists addressing the philosophical, social, and spiritual aspects of human nature,” Kiki Smith’s career has incorporated sculpture, printmaking, installation, and drawing. Primarily a figurative artist, Smith’s work explores the frailty and abjection of the physical body, and conversely, a spiritual existence predicated on mythological systems that include religion, astrology, and fairy tales. Smith is widely credited for treating the female form with extraordinary honesty and vulnerability. The daughter of sculptor Tony Smith, Kiki Smith was born in 1954 in Nuremburg, Germany, and grew up in New Jersey. In 1976, she moved to New York and supported herself as a cook, an electrician, and a factory air-brusher before joining Collaborative Projects (Colab), a cooperative artist group that worked outside the commercial gallery system. Colab launched a new aesthetic, one poised against the abstract art of the 1970s, marking a return to representation while aiming for an approach to art-making that emphasized accessibility to a wide public and artistic collaboration. It was during this period, which lasted until the late 1980s, that Smith developed her versatility and groundbreaking themes related to feminism, spirituality, and such issues as child abuse. “Valorizing the physical body as our primary means of experiencing the world, Smith sought to unravel its functions, marvel at its mysteries, and acknowledged its place within the wider environment,” wrote Wendy Weitman for the Museum of Modern Art in 2003. Exhibiting with Pace Wildenstein Gallery since 1994, Smith’s work has been shown in 150 solo exhibitions, at such venues as the Solomon R. Guggenheim Museum, the Smithsonian, the Walker Art Center, and the Whitney. In 2005, she was elected to the American Academy of Arts and Letters; most recently, the Rhode Island School of Design honored her for excellence in printmaking. Below: Kiki Smith delivering her address (left); the author with sculptor Eleonora Lecei (in foreground) on Medal Day. Thanks to Evan Halstead for the photographs.